The organisation’s annual checking events in 2015 revealed that out of a sample of 2,351 children (aged 0 – 11 years), 598 were in a booster seat and 82 were using an adult seat belt. Out of the 102 checks made in the older children’s category (aged 8 – 11 years), 34% of them were travelling using just an adult seat belt, when a booster seat was legally required. It is thought that this lack of regard for safety and the law, may partially be a result of children aged eight and above not wanting to use a booster seat as anecdotal feedback from parents suggests they are being pressured by their youngsters who don’t think it’s ‘cool’ to use them. Today, Good Egg Safety – the organisation geared towards making families of all ages safer outside and inside the home – has warned of the potentially fatal dangers of older children not using a booster. 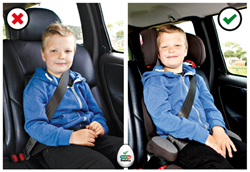 Jan James Good Egg Safety Chief, said: “We are very concerned about the results showing that a third of older children are not using a suitable booster seat. Not only is it a legal requirement for children to use a booster until they are 12 years old or 135cm, but equally importantly seat belts are designed for adult use and are not suited to a child’s anatomy. Across the total 680 children checked, an alarming 79 children (aged 2 – 11 years) were found not to be in car seat at all but required one and 67 children (aged 2-11 years) were in a seat that they were too small for. Of the 93 children (aged 2 -3 years) more than half of them were in the wrong seat for their age, weight or height. Statistics from the Department for Transport show that there is an increase in the number of children being killed or seriously injured in collisions – as well as sustaining minor injuries – once they reach the older 8 to 11 category. In 2014, there were 2,040 casualties among 8- to 11-year olds, compared to 1,553 among 5 to 7-year olds. Casualties among children (aged 8 – 11 years) make up almost half of all injuries among those under the age of 12. Honor Byford, Chair of Road Safety GB, the charity that supports road safety professionals, said: “We know that every parent’s strongest instinct is to protect their children. The legislation on booster seats changed to ensure that booster seats provide the level of protection that children’s smaller bodies need in the event of a crash. This keeps them on a booster seat for longer than used to be the case. We urge parents to check out the legal requirements and keep their children on the right booster seat for as long as their child needs that extra protection – which is until they are tall enough for an adult seatbelt to fit their body. Jan James Chief Executive is available for media interviews. Good Egg Safety Stage 2-3 report available on request. 1. Good Egg Safety, http://www.goodeggsafety.com, campaigns to help keep families safer. Good Egg provides information on safe driving for new and older motorists, family cycling, in-car child safety, and in-home child safety. a. The child is more likely to put the belt under their arm, or behind them, greatly reducing protection. b. Children will slouch forward so their knee’s bend over the edge of the seat, for comfort – this allows the lap belt to ride high up on their tummy. c. A lap belt that is too high can cause the child to submarine underneath the seat belt in a collision. d. A high lap belt can cause very serious internal injury to the abdomen, which could rupture internal organs. In this image the child is using a properly adjusted high back booster seat. The booster has lifted him up enough to allow the adult belt to sit safely across his hips, and the chest belt is running from his hip to his shoulder – the correct positioning. 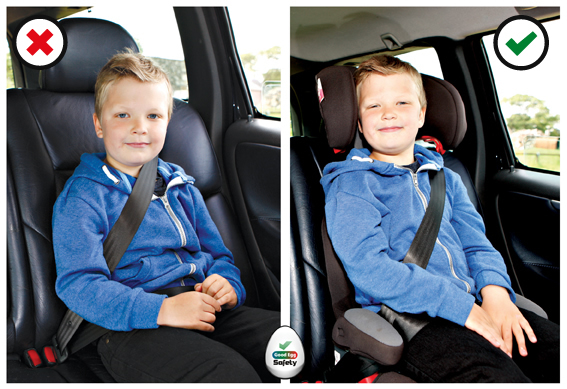 In a collision, the adult seat belt will now be able to work properly to protect the child. We always recommend a high back booster over a cushion as it offers better chest belt routing, along with side impact protection.